The relationship between an artist and the material they create with is a complicated and intimate one. At times, the artist chooses the material. But often, the material speaks to the artist and begs to be made into something wonderful. 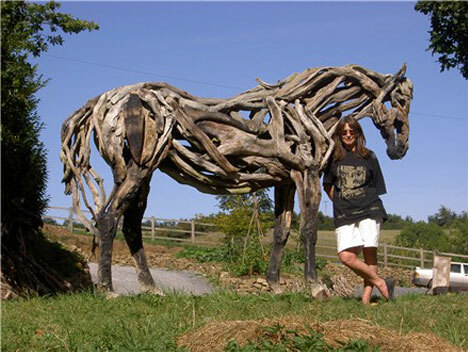 UK artist Heather Jansch has worked in several media, including paints, bronze, and wire sculpture. Almost by accident, she began creating beautifully unique sculptures from the irregular pieces of driftwood she finds on the beach. Heather Jansch’s driftwood sculptures feature a variety of animals, but the most abundant and notable subjects are horses. The artist has had a life-long love of horses, and it shows in the incredible detail she puts into her life-size horse sculptures. The magnificent figures are so lifelike and full of energy that they seem likely to spring into movement at any moment. Her work isn’t limited solely to horses and driftwood, however. 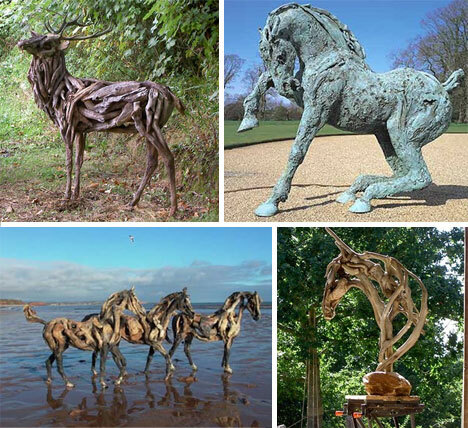 She also sculpts other animals from driftwood and casts some of her sculptures in bronze. Heather Jansch lives and works in Devon, near Newton Abbott. Her studios feature a large outdoor space which is sometimes opened for public viewing. A number of her sculptures are on display outdoors on the grounds, and visitors are invited to walk around and take in the beautiful surroundings. The artist also allows private visits at other times. It’s not every artist who can take a material as unconventional and unpredictable as driftwood and transform it into energetic and dynamic sculptures. Heather Jansch’s art is the perfect marriage of material, subject, and skilled artistry.